We’re closer to home this week with an old tale straight from the Cherokee. You can’t talk about the history of North Carolina without mentioning the Cherokee. They lived here, after all, and spread out to Tennessee, Georgia, and what is known as the Upstate of South Carolina. More than occassionally, you’ll run across someone who claims to be 1/4 or 1/8 or 1/16 Cherokee. Western North Carolina is abundant with their influence, whether in their language on the street signs in Cherokee, NC, or in the haunted feeling you get if you’re up that way, that feeling that you’re not the first to pass along that path. So it amazed me that, despite my obsession with local folklore and ghost stories, I’d never heard the legend of the Moon-eyed People. One reason might be is that the primary evidence given is actually in Georgia, in Fort Mountain. Remember, Georgia and North Carolina share a border, but not a very long one. In Fort Mountain, a wall over 800 feet in length, and all built of stone, meanders its way through the mountians, and its anyone’s guess as to where it came from in the first place. Literally. Every explanation, from religion to romance, has been offered as a theory for the origin of this wall. Religious practices are believed to be most likely. But there are folks who believe that a mysterious tribe of white-skinned folk dwelled there, built forts, and left behind a relic for us to find all these years later. These white-skinned people, with their beards and pale eyes and light hair, were said to only come out at night. According to where you’re reading the legend, they went to battle with either the Creek or the Cherokee. The Moon-eyed People, in both cases, lost the battle and fled, disappearing into the hills and hiding underground, in the hearts of the mountains themselves. Some believe that the Moon-eyed people were descended from a group of Welshmen led by Madog ab Owain Gwynedd, better known as Madoc. Supposedly, this man, a Welsh prince and the son of Owain Gwynedd, decided to take a jaunt away from his warring nation and come to North America. Madeleine L’Engle actually partially based A Swiftly Tilting Planet off this idea, and many historical accounts insist that there were Indians here who spoke Welsh, one white man even having his lifed spared (John Smith and Pocahontas style) when it was learned that he too spoke the Welsh language. Most of these accounts are from much later, in the 1600s and 1700s. Wales was already a thing and had been quite some time, and people were still ready to be dazzled and amazed by the New World. I, like most historians, personally don’t buy that the Moon-eyed people were a bunch of Welsh folk. The problem with that theory is that Madoc is said to have arrived shortly after 1100 A.D. That wall is old, thought to be built around 500 A.D., so it’s very likely not from this Madoc guy or anyone closely associated with him. If it’s thought to serve a religious purpose, it probably did. There might be nothing at all fantastic about that wall, and that’s fine. It’s pretty well known that a Viking settlement existed, though not for long, in Newfoundland, but that they never went any further. The native peoples weren’t welcoming to the Scandinavian people at all. North America was packed with people, until shortly before Columbus popped in. That was before most of them fell victim to a plague. That’s why I doubt the Welsh were here. But they weren’t what got my attention. All this argument over whether or not there were Europeans here before Columbus has completely overshadowed the fact that somewhere, this continent gained a collective memory of a mysterious people with origins steeped in a murky past. The Book of Mormon tells the tale of the Nephites, Jaredites, Lamanites, and Mulekites, all early inhabitants, fleeing to the American continent, from elsewhere in the world. Mormon archeologists do try to match up these beliefs with ancient peoples that we do have record of, such as the Olmecs, Incas, and Maya, but the geography is a little more interesting, with these Jaredites dwelling farther north, around what is now Michigan. I myself am not Mormon, so I don’t know all the beliefs, and most archeologists do refute that particular part of Mormon tradition, citing lack of evidence. But even if Joseph Smith made it all up, where’d he get the idea for a people not of here to be dwelling here? Part of the legend includes the Nephites going up against the Lamanites, which itself was an ongoing conflict, and which ended in the complete destruction of the Nephites. That’s two stories, from different cultures, about warring early inhabitants of North America, where only one group of combatants was ultimately left standing. The Piaute of the American West had one too, only they apparently fought a bunch of really big gingers, in an ongoing war, before eventually eradicating them by shutting the redheads up in a cave and setting fire to it. And a third story of a continuous war, between two peoples, that resulted in one side either being destroyed, or simply running away. There’s one more story, and I’ve touched on it before, when I covered The Devil’s Tramping Ground. This also featured a tribe that lost a battle, and fled. But the difference is that the Croatan made it. They got east. We remember them. They’re the ones that the Roanoke Colonists disappeared with. Only the Croatan were never pale faced and moon-eyed. What if they only left behind the name as a code, for those to follow who knew what to look for? Even if we discount all of the stories, it can’t be denied that somehow this ended up in our collective memory, and like the story of a worldwide flood that destroyed all of life in this planet, these tales are probably not the only ones. Back to Georgia we go. All stories have a grain of truth to them. Whether Gettysburg is truly haunted, I don’t know. But a battle did happen there, and many died. That’s the truth behind all the things that go bump in the night. Maybe, at some time in the past, there really were folks who fought a long-forgotten war, and one side disappeared into the hills, only staying behind as a defeated foe or pitied victim, a shadow we forgot about when the victors wrote history. Who were the Moon-eyed People, and where’d they come from? Why were they always defeated, or run off? Why did they always end up underground, dead or vanished? What if they didn’t die? If there are doors in the world, where do they go? Maybe we really are being watched in the mountains. So what do yall think is going on in the Baltic Sea these days? I was going to do a piece on the Moon-eyed People, an old Cherokee legend, but all this stuff about that supposed UFO in the Baltic Sea has really got me sidetracked. I would like an earlier update on what the team in the Baltic found. I’ll be honest, it sort of looks like a hatch. Wasn’t that why they dived in the first place? All snark aside, I’m pretty interested in this case. 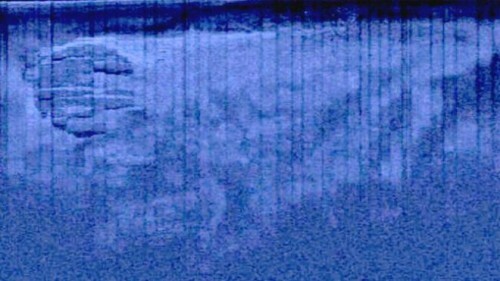 I remember first seeing the sonar image, and I thought it was pretty cool. I never expected anyone to actually go down there and check it out. I really want to know what they find, but apparently, the findings won’t be released until next week. So what could this weirdness be? The mission is fictional and acting as viral marketing for Ridley Scott’s film Prometheus, to get people talking and searching and things. However, it is a Ridley Scott film and people are already inclined to talk about his work, this one especially, as is the case. Second, viral marketing often starts quite a bit ahead of time, not the day of the premiere. People are already going to see it anyway. It’s an actual alien craft that crash landed on the Baltic Sea and sank. It needn’t be a whole ship; that could just be a piece of the hull. There is a “crash-track” beside the circle, but that would mean it was more of a submarine type of craft. A fast one, apparently. Steven Spielberg’s 2005 War of the Worlds comes to mind. It might be a leftover from failed Nazi experiments. Hitler was known to have bad ideas and then throw a tantrum when they weren’t implemented in a timely manner. It’s really no more or less possible than an alien craft, but the problem is that it would require launch from pretty far away, the ability to make it far enough to crash in the Baltic Sea, and a huge mass to make a crash track and sink so quickly, especially being saucer shaped. It would perhaps no longer be a saucer shape after that. Another option is the one offered that the round thing could be a hot spring leaving mineral deposits behind that would make that shape. But the circle is so perfectly round, which is why it’s so weird. It appears that the thing, whatever it is, is actually there and something not quite like anything the divers have seen before. Back to my hatch theory. If it’s a hatch, then that of course means it’s a door. But where would this door lead? Remember my theories on doors between worlds, ways to cross the divide between places? Disappearances for which there are a few explanations, but no one’s ever sure, abound in history. The Devil’s Tramping Ground, Roanoke Island Colony, and even that unassuming Beaufort cemetery all point to the utter strangeness of such a gate. I’ll go ahead and give you a little preview for the moon-eyed people post. They were said to come from underground. What if they were just coming from somewhere else? So as the world watches for a report on what’s known as the Baltic Anomaly, I’ll keep an eye on the weirdness. Maybe it’s nothing. But maybe it’s the biggest something ever.